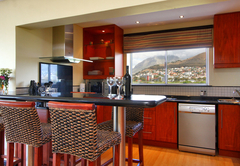 Atlantic Ridge is a property providing self catering in Mouille Point for up to 4 guests visiting the Atlantic Seaboard region. 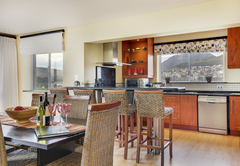 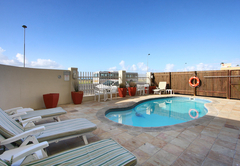 Atlantic Ridge is a two bedroom luxury apartment offering accommodation in Cape Town on the Mouille Point Platinum Mile. 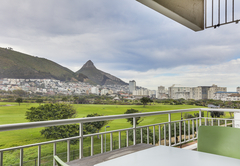 It is ideally located in relation to the City Centre, Table Mountain Cableway, Robben Island and the world renowned Clifton and Camps Bay beaches. 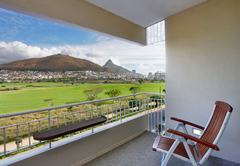 The apartment is directly adjacent to the magnificent seafront promenade and the Mouille Point Lighthouse and its outlook includes an uninterrupted view over the magnificent Metropolitan Golf Course as well as sea views from the balcony and main bedroom and lounge windows. 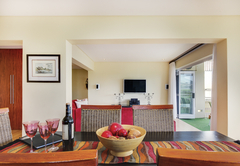 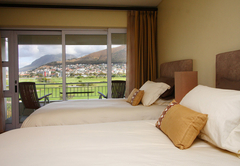 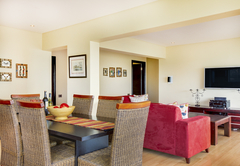 Boasting views of the sea, mountains and golf course, this self catering apartment sleeps five guests. 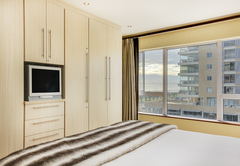 There are two bedrooms (one furnished with a King-size bed and the other with two single beds) and the study is furnished with a sleeper couch. 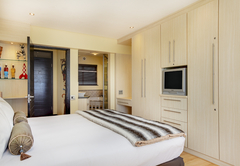 There are two bathrooms; the main bedroom has an en-suite bathroom and there is a separate bathroom for the second bedroom. 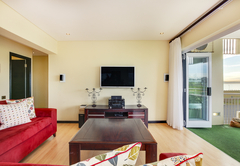 Satellite TV is provided. 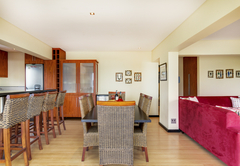 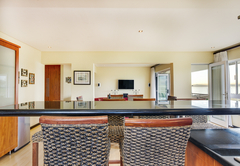 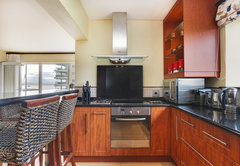 The kitchen is fully equipped for self catering and guests can make use of the communal swimming pool. 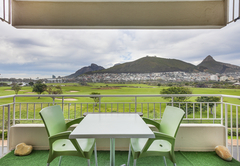 An upmarket gym, golf course and health spa as well as restaurants, delis and coffee shops are within strolling distance. 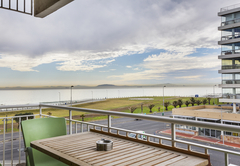 The V&A Waterfront with its shopping centres and many historical, cultural and leisure attractions are an easy ten minute walk away. 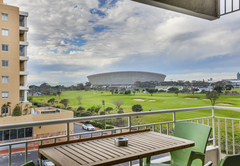 The Green Point Soccer Stadium is a leisurely five minute walk away. 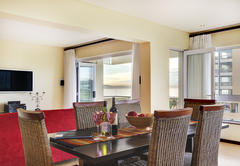 Soak up the sights and sounds of the ever-changing Atlantic Ocean and its armada of passing ships, fishing boats and yachts or unwind and enjoy a sundowner whilst experiencing a magnificent African sunset. 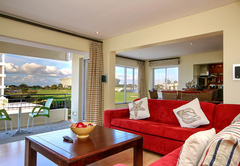 Boasting views of the sea, mountains and golf course, this self catering apartment sleeps five guests. 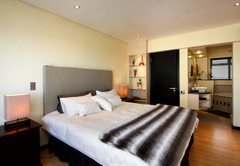 There are two bedrooms (one furnished with a King-size bed and the other with two single beds) and the study is furnished with a sleeper couch. 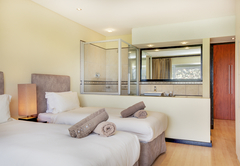 There are two bathrooms; the main bedroom has an en-suite bathroom and there is a separate bathroom for the second bedroom. 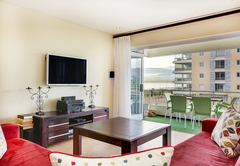 Satellite TV is provided. 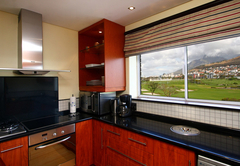 The kitchen is fully equipped for self catering and guests can make use of the communal swimming pool.